Amazon Elastic MapReduce (Amazon EMR) makes it easy to process vast amounts of data in a variety of applications, including log analysis, web indexing, data warehousing, machine learning, financial analysis, scientific simulation, and bioinformatics. 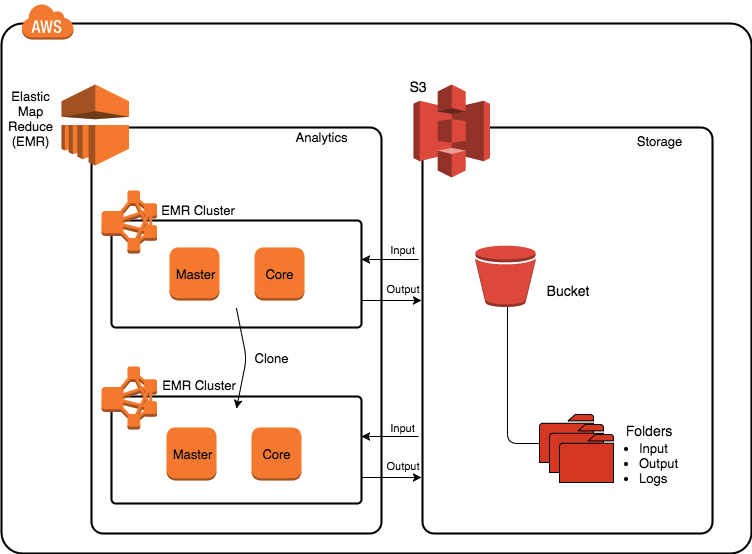 Amazon EMR uses Hadoop, an open source framework, to distribute raw data and processing across a resizable cluster of Amazon EC2 instances. Hadoop uses a distributed processing architecture called MapReduce in which a task is mapped to a set of servers for processing. The results of the computation performed by those servers is then reduced down to a single output set. The focus of this lab is configuring and launching an EMR cluster. You will be provided with sample input data sets and sample applications to process the data sets. Treating the application and data set as a "black box" will lift unneeded complexities and free you up to concentrate on the configuration component. Note that Amazon EMR does a massive amount of heavy lifting for you. In addition to providing security, reliability, monitoring, scalability, integration with other Amazon services and the potential for cost savings, Amazon tackles the deployment as well. For example, Amazon will configure the instances in your cluster with all the necessary software and versions of the software to process the tasks you submit.